Andre Tchelistcheff~ Winemaker of the Year!! Blair Fox, a native of Santa Barbara, started his winemaking career in Santa Barbara County after his graduation from U.C. Davis with a degree in Viticulture and Enology. At U.C. Davis he found he had a passion for Syrah and other Rhone varietal wines. Upon his return to Santa Barbara he found Santa Barbara County to be widely planted in Syrah, Viognier and other Rhone varietals and gaining a significant amount of praise and recognition from wine writers and consumers alike. It was a natural fit. Blair was immediately employed as Head Winemaker for a small family run winery in the Santa Ynez Valley. At this time, he and his wife Sarah (who are high school sweetheart's) decided to create Blair's ultra-boutique eponymous label, Blair Fox Cellars. After over three years of making award winning wines, he left the Santa Ynez area and traveled to the Rhone region of France for further investigation into these extraordinary wines. He found the regions of Cote Rotie, L’Hermitage and Condrieu to be of most interest. There he tasted some of the finest examples of Syrah and Viognier in the world! After this excursion, he returned to Santa Barbara only to be lured away once again. This time he became engulfed in the marvelous Shiraz of Australia. After becoming the Vintage Winemaker for Haselgrove Wines in McLaren Vale, South Australia he fell in love with the area, wines and people of Australia. This is where he learned to believe in “terroir” and taste the earth in the wine. After this international winemaking experience, Blair felt it was time once again to return home where he found employment with Fess Parker Winery as the Rhone Varietal Winemaker. 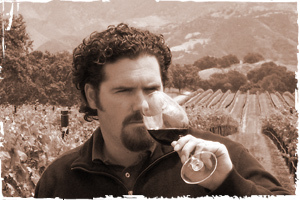 In 2005, Blair was promoted to Head Winemaker at both Fess Parker Winery and Epiphany Cellars. Today he continues to craft superb Rhone varietal wines for his Blair Fox Cellars label. Blair Fox was awarded the Andre Tchelistcheff Winemaker of the Year Award at the San Francisco International Wine Competition, the largest wine competition in the world!